Lasagne. 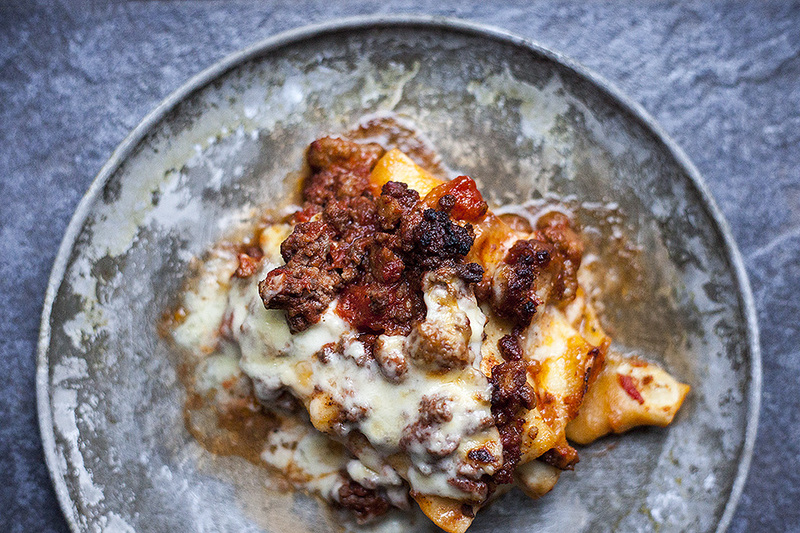 A word needing no adjectives to provide a clear visual of tender pasta layers, rich meaty tomato sauce and mountains of gooey cheese oozing on your plate. Sadly, the image might be thick, gummy, curly edged pasta with insipid, heavily oreganoed [not sure if that’s a word] hamburger sauce and watery cottage cheese baked until it’s dry enough to hold its shape when plated. The second description was my introduction to lasagne; spelled lasagna on the chalk board outside my high school cafeteria. Friday’s ‘paste and glue’ lunch special tasted exotic yet somewhat gelatinous. Years later, I was introduced to fresh, thin layers of pasta. Those lovely, delicate sheets of pasta changed everything. Searching for the perfect harmony between flavours and textures became my holy grail. I experimented with a myriad of sauces, cheeses and pasta flavours. For the most part, as long as the lasagne was balanced, it worked. However, every now and then a lasagne will stop me in my munching tracks. I’ve been working on Italian by Night’s newest menu over the last three weeks. – This week was my deadline hence my on-line absence. Each season, I create a new lasagne combination. During the warmer months, I concentrate on lighter sauces and cheese. Conversely, the colder months celebrate heartier sauces and cheeses. All that to say, I hadn’t been able to stop thinking about my latest lasagne creation. Creation sounds a bit lofty but I kid you not, last night I struggled not to do a face plant at the dinner table! The recipe I’m sharing today was inspired by the recipe that I created for Liz. The process will seem long at first glance but, once you get the hang of it, you’ll see that things can happen simultaneously. In honour of full disclosure, I want to explain my short-cuts. I used commercial fresh pasta. It’s not as tender as homemade but, when I’m pressed for time, it’s close enough. I used bocconcini [ small balls of soft mozzarella] instead of shredding my own or buying pre-shredded. I simply prefer the way the thicker, softer mozzarella melts. Finally, I bought pre-ground beef and store-made sausage. If you’ve been reading my blog for a while, you know about my propensity for grinding my own meat. Still, my taste buds will not be held hostage to my time restraints! The combination of the slow-braised beef and pork tomato sauce, roasted sagey buttercup squash, to-die-for asiago balsamella and lavish amount of fresh mozzarella has made my latest lasagne spelled as the Italians do possibly the most delicious lasagne I’ve ever eaten! 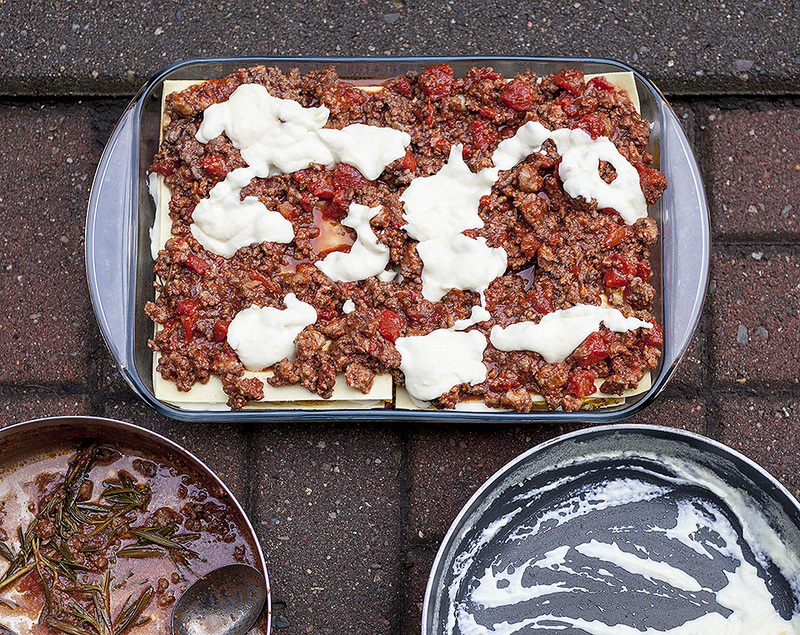 Prepare a 9 x 13 lasagne pan with a food release spray. 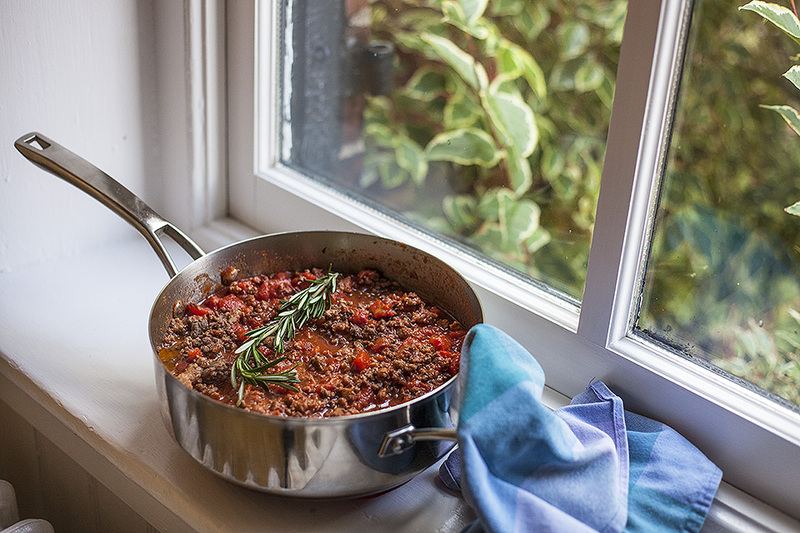 Cover the bottom of the pan with a thin layer of Bolognese. Cover the sauce with a layer of pasta then spread with a heavier layer of Bolognese. 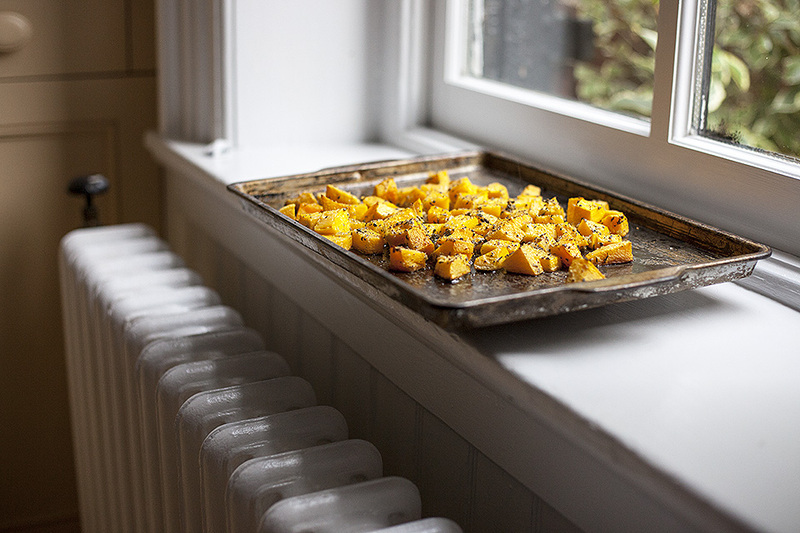 Cover with all of the roasted squash. Pour the asiago balsamella over top [ reserving ½ cup for the top layer] then spread it out evenly. Bake uncovered at 400* – 35 minutes or until cheese is golden and sauce is bubbling. Allow to cool for 10 minutes then portion. Pour onto a baking sheet. Roast in the oven for about 30 minutes, or until fork tender. In a medium sauce pan over medium high heat, melt butter until it’s foaming. Pour cream in a steady stream into butter/flour mixture, whisking constantly until mixture is smooth. Add shredded asiago and stir until well combined. Add ground beef and sausage then cook until all of the pinkness is gone. Break up the sausage meat and ground beef as it cooks so that it resembles minced meat. Add milk and repeat process. Lower heat to a simmer and cook until thick – 30 minutes to two hours. It will depend on your tomatoes. 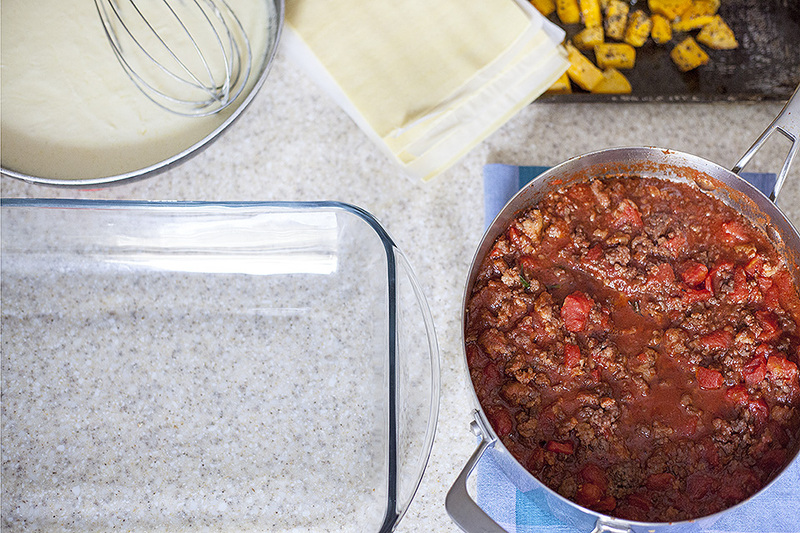 THE LOVE: Make sure you’re working with a low heat so you don’t scorch your sauces. 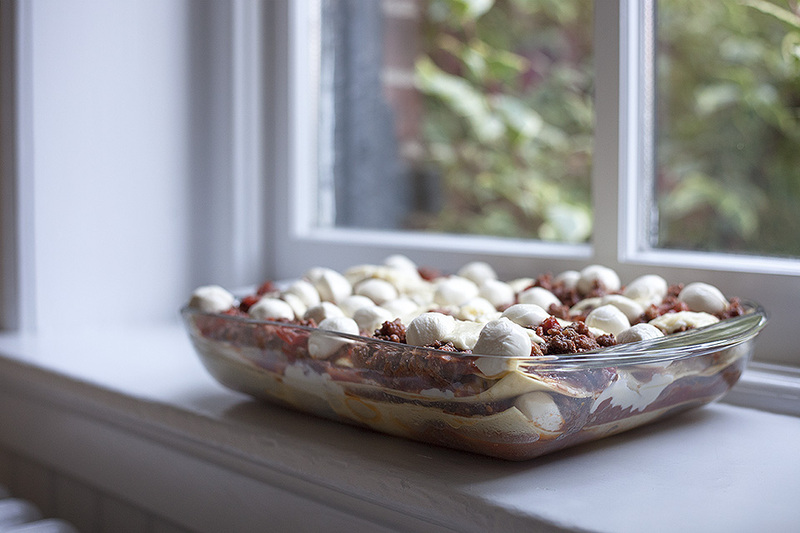 This entry was posted in italian food, pasta/risotto and tagged asiago cheese recipes, autumn lasagne, butternut squash and sage recipes, hearty lasagne recipes, lasagne recipes, sausage sauce by Michelle. Bookmark the permalink. I am going to have to try this. The girls and I just got back from Italy and while in San Gimignano we had lasagne. It was made with sheep cheese and had white truffle balsamic vinegar no tomato sauce. It melted in your mouth. I have never tasted anything like it before!!. Hi Meinhilde, It really was! The asiago is delicious with the sage and butternut squash. I’m thinking of doing a pasta dish with just those ingredients. Stay tuned… Thanks for reaching out! This was amazing! My guests loved it!